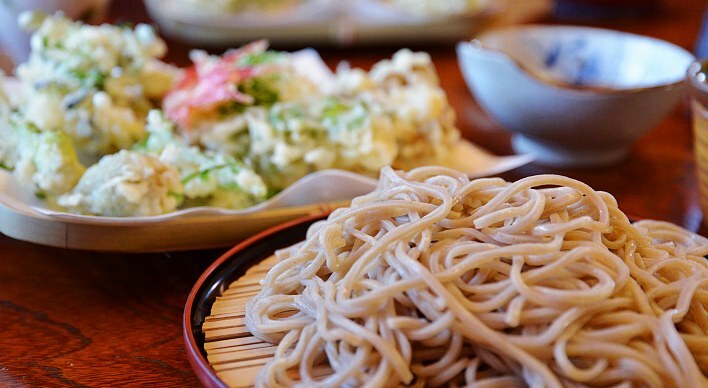 One of my all-time favorite meals in Japan: vegetable tempura and zaru soba. No soba for me this time though. Because we take off on our Japan adventure in a few days there was no sense in making a menu this week. The mission continues to be making sure everything perishable in the fridge gets eaten before we go. We had to postpone a couple of days from last week’s menu in order to use some things before they turned on us, so tonight we’re having lumpia, rice and coleslaw (to use up the last of some cabbage) and tomorrow we’ll be having the homemade fishcake sandwiches we didn’t get to have last week. YaYu has a track meet on Thursday afternoon/evening, and Brett will be taking leftovers along for himself and YaYu, and I’ll figure out something here at home. We obviously won’t be going to the farmers’ market, but as it turned out our favorite farmers won’t be there either – they’re going home to Thailand for two weeks..
Tonkatsu – Brett and I will probably share an order. Ramen: YaYu LOVES ramen, and she didn’t get to eat this the last time we were in Japan. So, we have promised her we will stop at a ramen stand and she can eat her fill. 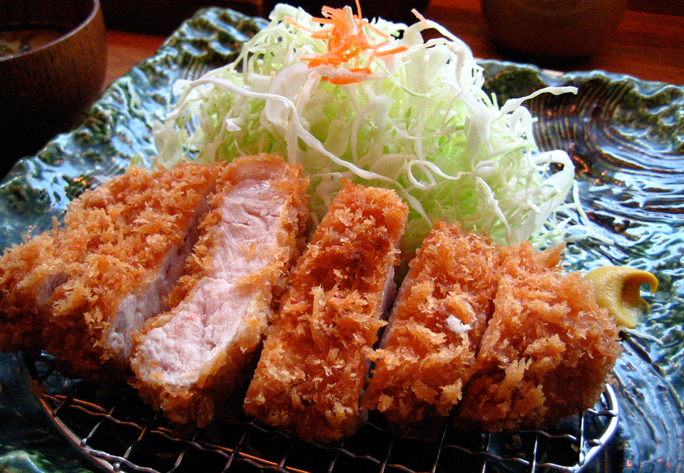 Tonkatsu: This is a very tender pork cutlet coated in panko crumbs and fried, served with finely shredded cabbage and rice, as well as a delicious sauce. I will skip the rice, but think otherwise I’m good to go with this dish. Curry: Our grandson wants to take us to his favorite curry restaurant, designed to look like an old train car. Other than the rice, curry is low-carb, so I’ll just ask for my rice on the side (and skip it). Sushi: The real deal. I plan to order chawan mushi though, a savory custard with shrimp that’s served at sushi restaurants, and also some sashimi. Tempura: Again, this is one of those things that just tastes better in Japan. I love vegetable tempura! Rice: No rice means going without one of my favorite Japanese meals, katsudon, a breaded pork cutlet cooked with onions and egg, and served over rice. Hato Sabure: I know we’ll buy some of Kamakura’s famous “bird cookies” to bring home, but none for me this time. Maybe Brett will let me take a bite from one of his. Bakery goods: This one is going to be difficult, as Japan has incredible bakeries, and I will especially miss not having the world’s most delicious raisin bread that I was so looking forward to (it comes from the bakery across the street from our son’s condo). I’ll also have to skip having one of the amazing almond cookies from Chinatown. McDonald’s teriyaki burger and yogurt shake: These are the only items I’ll ever eat from McDonald’s, and only in Japan. Not this time though. Crepes from Harajuku: I’m making a sad face right now as I write this, but Brett said I can have a bite of his. I know I will be telling myself, “Come on, you’re in Japan – enjoy yourself!” but I also know now that I would pay dearly for any of them so hopefully I’ll be able to resist so much temptation. The Sakura Blossom Creme Frappuchino and Latte was this year’s special flavor, and today (3/14) is the last day they’re available. So sad! 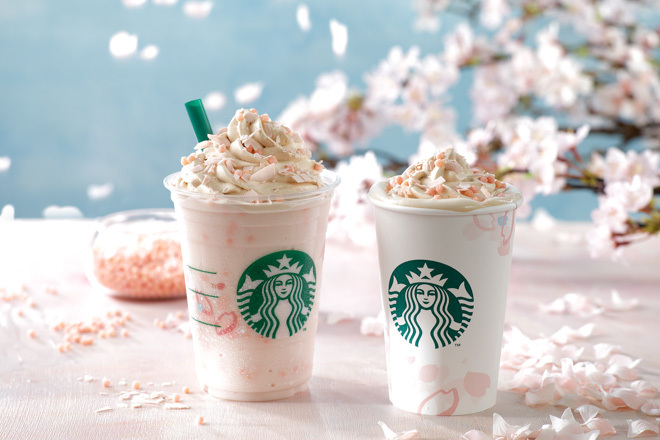 We’ll also miss by a couple of day this year’s special cherry blossom Frappuchino at Starbucks. They create a new flavor every year, and this year’s looked especially good. Oh well. Previous Post But Will It All Fit? I’m so jealous you get to visit Japan. It must be so exciting and that your son lives there. I doubt I’ll get there in this life so I especially love your posts. Although we aren’t so much anymore, at one time everything for us was Japanese influenced( past life)?? even our daughter’s name, Sachiko. It is exciting to have a good reason to visit Japan, but at the same time I wish our son and his family didn’t live so far away. I would give anything to be able to see them more often. Is it terrible to brag that I had both the cherry blossom latte & McD’s teriyaki burger last week (at the airport). We did eat at more traditional restaurants the rest of the time. I also had katsudon! 🙂 Hope you have a fabulous trip!!!!! Thought of you as soon as I got to Tokyo. 🙂 We stayed at the Ritz this time in mid town, and it was lovely. I am genuinely jealous that you got to try a sakura blossom latte! Oh well, there will be plenty of other sakura treats around – I had sakura ice cream on our last visit and it was divine. The best “special” flavor I ever had at a Starbucks in Japan was matcha brownie: a green tea frappuchino with pieces of brownie in it. It was amazing. And, I’ve decided I’m going to have a teriyaki burger – I’ll just take off the bun and eat the hamburger with the lettuce and sauce. The Ritz in Midtown – I’m impressed! Haven’t you stayed at the Grand Hyatt before (in Roppongi)? Our son lives about a 10 minute walk away. I am so happy for you since you will get to see your family and also visit a place you love so much. I have planned two vacations this year. Late April-Early May, mom, sis, BIL and I will most likely visit Chios Island in Greece which is a forty-five minute ferry ride from Izmir where my sis lives. Late August, early September, I shall go to the US to spend a week in upstate NY and a week in Charleston SC with my American friends. So looking forward to both. Your upcoming travels sound wonderful! Brett has been to Greece several times (thanks to the navy) and hopes to go back again some day. We loved our visit to Charleston many years ago – we took a walking tour around the city which was a great way to see things and learn about the city’s history, culture, etc. Aloha from Oahu! The weather has been great but more humid than other times I’ve been here. We aren’t coming to Kauai on this trip, but want to get back there soon. I hope you have a wonderful time in Japan and I think you should allow yourself to have some of those ‘forbidden’ treats! It’s been humid here too. I’m glad you’ve been having good weather – ours has been so-so over here. Yesterday was gorgeous but we were right back to rain today. I think if I get a bite of one of the “forbidden” treats I’ll be OK (especially the crepes and one of the bird cookies).